3,966 backers pledged $556,541 to help bring this project to life. The Kickstarter is over, but if you missed out on backing us, not to worry. You can still join the thousands of other awesome Twine owners by pre-ordering on Supermechanical. It's the next best thing to being an original backer! Want to hook up things to the Web? Maybe you want to get a tweet when your laundry's done, or get an email when the basement floods while you're on vacation. Even if you're good with electronics and programming, these are involved projects. Instead of worrying about wiring or networking code, you can focus on your idea. Twine lets you create Internet-connected systems and objects anywhere you have WiFi. Compact, low-power hardware and real-time web software work together to make networked physical computing simple and versatile. Twine is a wireless module tightly integrated with a cloud-based service. The module has WiFi, on-board temperature and vibration sensors, and an expansion connector for other sensors. Power is supplied by the on-board micro USB or two AAA batteries (and Twine will email you when you need to change the batteries). The Spool web app makes it simple to set up and monitor your Twines from a browser anywhere. You set rules to trigger messages — no programming needed. The rules are put together with a palette of available conditions and actions, and read like English: WHEN moisture sensor gets wet THEN tweet "The basement is flooding!" 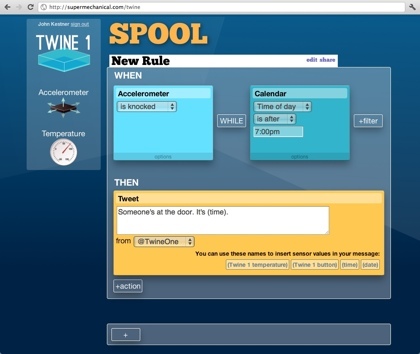 We'll get you started with a bunch of rule sets, and you can share rules you create with other Twine owners. Because the hardware and software are made for each other, setup is easy. There's nothing to install — just point Twine to your WiFi network. Sensors are immediately recognized by the web app when you plug them in, and it reflects what the sensors see in real time, which makes understanding and testing your rules easy. When you plug these into the multipurpose jack, they pop up on the web app ready for you to add to your rules. If we go over our Kickstarter goal, we'll be able to develop additional sensors for you to choose from (up to three). For every additional $10,000 we raise, we'll offer our Kickstarters the chance to vote for another sensor. These might be an RFID reader, a pressure sensor or a current sensor. Update: We went *way* over our original goal, so we're going to be making all three of the new external sensors. Backers can expect to see the first poll soon. We'll put the projected cost and availability dates for each sensor in the poll. Each of these let you include sensor values (like the temperature) and your own text. We've sent the physical holiday cards to the printer, but the digital "print-at-home" edition is still available. Drawing on our experience in hardware and software, we've spent the last few months creating working prototypes and near-final forms. We are truly excited about getting Twine into people's hands to see what new uses others will find for it. Our Kickstarter will fund final refinement of our prototypes and the equipment and parts needed for production. The more funds we raise, the quicker we'll be able to add new features that make Twine even more powerful and simple. We have big things planned — and because it's all on the network, software upgrades to the web interface and to Twine itself come automatically to you. If you agree with our vision of simple physical computing, contribute to our project with your dollars, word of mouth, and creative ideas for Twine! You'll get a special Supermechanical T-shirt that lets others know that you got on the bandwagon early. You'll also be the first to know about new Twine features and updates. Support us and be a part of a product that makes physical computing radically simpler. 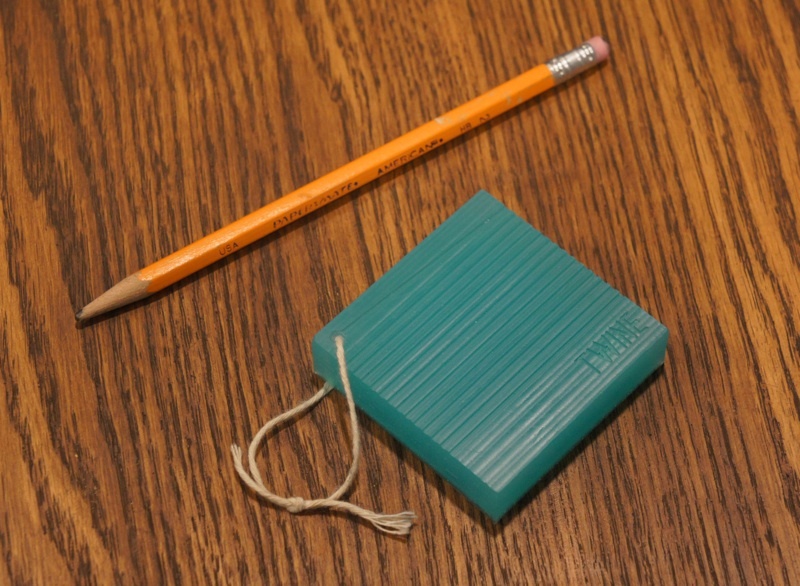 You are preordering one Twine, with built-in temperature and motion sensors. Batteries included. You'll also get a card suitable for pre-gifting Twine in time for the holidays (see Holiday note). Of course, free shipping too.